SO much learning can happens with our kids every day when we simply inspire them. Yesterday morning we had table time and I brought out art supplies, art paper, and, something new. If you saw on Instagram yesterday (find me here), I'm in the process of making over our less functional "art room" for something better. In the early morning I began filling a box with tattered and unexciting childrens books during the room makeover. I let the kids use the too-worn-to-donate childrens books for any creative project they could imagine. You would have thought I just announced free chocolate cupcakes for a lifetime or something by their initial surprise and then total excitement! And their creations were even more spectacular than I could have imagined. I like to put supplies out, maybe suggest a few ideas and then step back. They hear me remind them often while I'm in the kitchen or elsewhere to let me know if they need my help. And then their real work begins. All of my kids start at the table and sometimes their ideas lead them to gathering supplies from other rooms or merging their creative work on the table with some creative play elsewhere. Here's a cute little video segment of Annabelle + Ainsleigh's intense work at the table. My favorite is Ainsleigh's focus as she masters rolling tape--all on her own! We have had a wonderful week of transitioning from adventures + family in NYC to Easter + family back in Pennsylvania. I've been excited to finally make some simple linen Easter egg-hunt baskets for my youngest three this year. The morning before we left for NYC I quickly finished sewing off the last basket. I left the simple initial embroidery for Sunday morning when the house was still quiet from sleeping-in, worn out travelers. My kids enjoyed their first Easter egg hunt with their out-of-town cousins in years. The pictures tell it all. And the little linen baskets held up well to swinging, twirling, and the load of filled eggs. We watched our Church's annual worldwide conference, went on sunny walks, and spent the whole day at Grandma + PaPa's. A wonderful family Easter. I was inspired by these cute mini linen baskets but they were way too small. So I made up my own pattern for the bags using linen, heavy-duty iron-on stabilizer interfacing, lace trim, and some vintage fabrics for the handles. They turned out simple and sweet, just the way I wanted them to be. I hope you had a special weekend with your loved ones as well. There has been a lot of imitation happening in our home. This is a sign to me in my little world of mothering and family life that life/unschooling is good, young minds are creating/problem solving, and my kids' understanding of the world around them is expanding. When kids imitate something inspiring that they see, they are driven by the thrill of trying something new and the satisfaction of physically understanding their world in an intimate way. Children are driven by imitation. It drives so much learning and development. It is the most natural process of learning for children and adults alike. 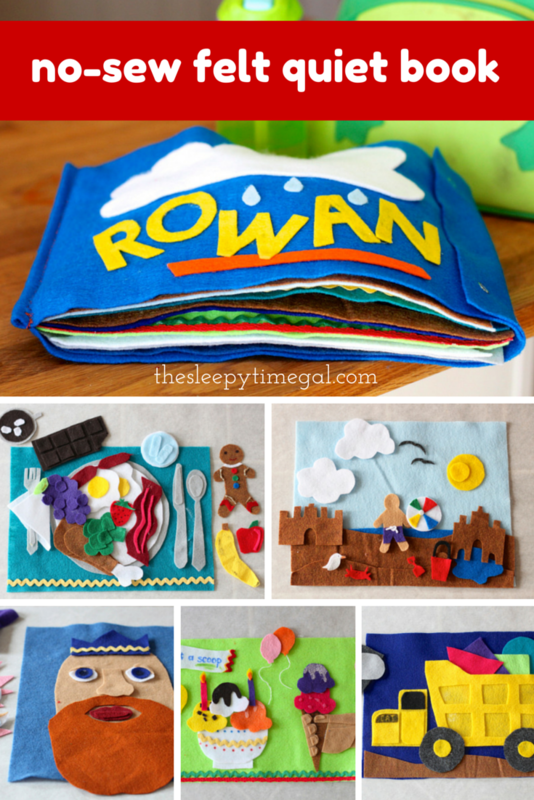 And before you get tired of hearing about Rowan's quiet felt book, I'm pretty excited to show you his book tomorrow. I'll also include my tips for creating your own no-sew felt quiet book. The more I keep up my daily 5 minute journal the more I see "good luck charms" in my life. I don't actually believe it is "luck" but blessings, inspiration, and positive consequences to action taken. If I can be confident and disciplined enough to let my desires outweigh my fear (whether in homeschooling, mothering, or personally) then magical things happen. Like being granted greater desire + discipline to do and be more. Moments of success. Overcoming weaknesses quicker. Power to see positive rather than negative around me. A happier home life, kids, and self. I know the exact mother I want to be. And so work daily to remind myself of those traits I want before I'm tested in those situations. My success rate is actually getting better in those predictable situations! With daily, written positive affirmations, I can see myself changing from the less patient, sometimes overwhelmed mother of five to the calmer, prepared mother that knows how to enjoy motherhood more and better embrace the challenging parts as well. I'd say that one of our current "good luck charms" is the power to dream big + then plan. We catch a vision and then try to capture exactly what it is that we want out of an experience or goal. This truly is one of the greatest lessons I hope to instill in my children at their young ages. ...something larger than life with costumes, the setting sun out in the backyard, feasting, music, and the tinkling of finger cymbals. And so with the "good luck" of life existing in the air, we are going full force towards everything that appears attainable and unattainable. Meet the happiest pillow on the block. She's soft and huggable and quite fashionable. Ainsleigh chose this adorable project for their young friend turning three. I haven't made any dolls recently since Rowan's birthday doll last fall so was excited about familiar and unfamiliar steps that this project required. The pattern is from one of my favorite sewing books [amazon_link id="1584798580" target="_blank" ]Wee Wonderfuls: 24 Dolls to Sew + Love. [/amazon_link] I've made many dolls from this book for my kids, their cousins, and some of their friends over the years and the concept of a felt doll sewn onto a pillow (with a pocket to hold the doll's dress-up clothes) sounded like the cutest gift for a beloved little friend. It started with sewing a soft fleece pillow with the doll's felt body and hair sewn to the front of the pillow. (The twins cut out the patterns and felt.) I spent a quiet, early morning huddled around my space heater in the basement carefully embroidering the doll's face and split embroidering her hair. The best, most surprising part of the little pillow is the elastic pocket in the back. I chose a vibrant, colorful fabric that would accentuate all of the colors in the doll's clothing. Here is Little Miss' raincoat, rain hat + boots. Party dresses, bobby socks, a linen top, cords, pajamas and variety of tops were simply edgestitched to the felt and embellished with ribbon, fabric marker, or applique. My favorites are her pajamas + gathered pink party dress. I'd like the dress in my size. It was no surprise to me that after Little Miss' pillow + clothes were finished my Annabelle and Ainsleigh were not only over-the-top proud that they helped make it but were over-the-top excited giving it to their little friend at her birthday party. I mean, over-the-top. Including Rowan. I was pretty excited to help throw a baby shower for a friend using her preferred baby colors that were baby Rowan's colors: yellow + gray. Using up the last scraps of my favorite fabric I used for Rowan's basket liners, I made a simple fleece-lined bib + matching wash cloth for the baby's first mealtime. I've left the beautiful paper flowers hanging over the weekend. I'm dying to learn how to make them for my to-be sister-in-law's bridal shower here this summer--think reds + burnt oranges. (Yes--my little brother is getting married this fall!) 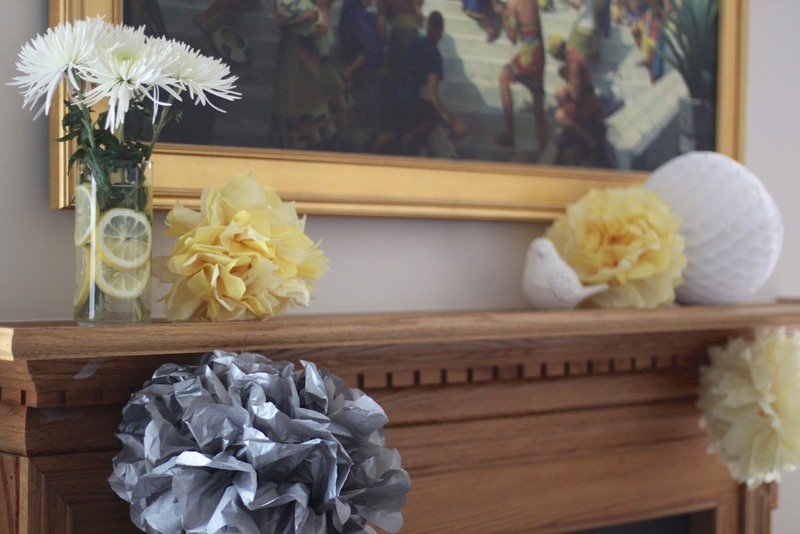 My friend makes these colorful paper flowers for every gathering and they never lose their classy touch. The subtle yellows seem quite fitting for the first day of spring coming this week. And boy, are we ready. Have a great start to this week. Go out + live boldly!